This talk was delivered by John P Wilson, Clerk of Assembly, at the Bundoora Presbyterian Church on 28th June 2017. OK, but this boy really WAS genius. There were others in the family: Charles, Antoine and Francois but Jean Cauvin WAS THE ONE, born 1509, deep in the heart of Catholic France, in Noyon … a cathedral city about 120km north of Paris. I wouldn’t want to be a medieval-age kid. I’m far too soft! In a typical late-medieval home, a lot was expected of them from an early age … these kids were raised with severity, came under strict discipline and felt the pain of whippings on seats of learning. They faced the peril of childhood diseases and summer plagues. Yet, it had its appeal. If they stayed out of trouble, they could live with some comfort of life’s rhythm. A city could offer families a stable society, and the church watched over them by the rhythm of the religious year. And, living in a cathedral town meant treats for kids watching feasts week after week after week as every ‘saint’ imaginable was given a special day somewhere on the church calendar. So, gazing at priestly vestments and church banners, watching the hubbub of pilgrimages and march-pasts, eating scraps from banquet tables, smelling candle smoke, hearing bells – all gave some relief to the mundane medieval day. Gerard wasn’t rich, but he had a job. He was a successful lawyer and held influence at the Cathedral of Noyon. In these days the Cathedral clergy had sufficient means to offer beneficiary positions to trusted people. We have no idea what people did for their benefit – it could have been anything from mowing the lawns, writing letters for the bishop, to visiting the sick in the name of the church. By some means he secured a beneficiary for each of his three sons. Which leads us to our very earliest information about our genius boy. At the age of 11, 1520, Jean Cauvin, through favour gained by dad, was introduced to formal religious life – employed by the Bishop. He was given the expected clerical haircut, and found himself a bishop’s assistant – at the feet of one of the most powerful men of the city, educated under the bishop’s tutelage and patronage. We’re not sure if it was due to the Bishop’s patronage of the Cauvin family, but Jean was sent to Paris at the age of 12 for elite education, to a famous boarding school, College de la Marche, where he studied a general arts course in philosophy, Latin, poetry and logic. I’m guessing that it was a form of indentured education provided as a benefit that they were expected one day, to repay. After just a year, the young genius was accelerated to commence his BA degree at College de Mantaigu – a Roman Catholic stronghold where candidates for the priesthood expected to start training. It was strict, and it was a monastic-order regime designed to train the body, mind and soul. So here was Jean Cauvin, not yet 16 years of age, studying medieval theology, rhetoric, grammar, reading Aristotle in Latin, tracking towards the Roman Catholic priesthood. BUT there was nothing much warming his heart in all this … yet his life, pleasing dad, moved along towards the church, with a view perhaps to repay his debt back at the Cathedral. So, even though serving in the Church, he had no heart for it. The French church of his day (1520s) was un-touched by reform and basically fear-driven, superstitious and secular. He was dissatisfied with a religion that was largely consisting of outward observances. He found no rest for his conscience in following the traditional religious practice of Roman Catholicism, but he didn’t know why. Dad steps in, without explanation, and removes his son and sends him to University of Orleans to study law. What was Gerard Cauvin doing? Was there more money in law than the church? A major sea-change. Even geographically: Orleans is 140km south of Paris, this was a whole new world, this opened our 17 year old teenage genius to new influences, radical thoughts and a new career. There were no restraints of the monastic regime. At Orleans, there were new student friends who were to influence his life and … some radical tracts from a Catholic heretic from Germany about to get his attention. It’s 1526 … let’s leave the young teenager for the moment … at Orleans, studying law. I want to backtrack for some context. How did God ‘engage’ the first reformers? What first stimulated them to grasp the gospel of grace? What were Martin Luther’s sources for 95 theses and his spiritual breakthrough? By contrast, what were Calvin’s sources that led to a spiritual awakening? We haven’t come to this yet as we’ve put Calvin’s life on hold in 1526, but Calvin’s spiritual awakening took place in the last few years of the 1520s. Which makes him 2nd generation. Martin Luther had been writing evangelical tracts for years. And further, he had his break-out year in 1520 when he sent out his fearless and piercing critique of the Roman Church: ‘On the Babylonian Captivity of the Church’. So, his book with the stinging critique of 16th century Catholicism had been sitting on Koorong’s shelves for 6 years. Luther paved the way. Luther’s writings turned the attention of Calvin. Luther was old enough to be Calvin’s father. Further context: the brilliant Christian humanist Erasmus had published at least his second monumentally important edition of the complete Greek New Testament by the mid-twenties, something Luther never had in front of him at first. Don’t misunderstand me. I’m not relegating him to the reserves bench. Calvin became the most radical reformer and went back to all the original sources available to him in a most thorough and systematic way. The backdrop I want to paint is: The first-wave reformers were ground-breakers, men who could break down barriers and storm the fortress. But Luther and his followers and successors were not in a position to develop a systematic body of teaching that would carry the reform forward and consolidate it. In fact, there was a danger that the reformation would fall apart at the seams. The followers of Martin Luther in the German provinces and those of Zwingli in the Swiss states were some way apart from each other in doctrine and even further from each other in spirit. Both movements were under attack from the Roman church as well as from the more independent Anabaptist reformers. The second generation of the reformation needed someone to systematically organise and communicate the teachings of reform. 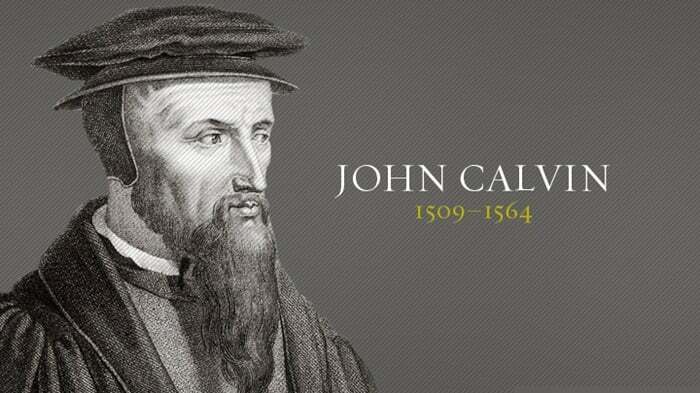 And it was John Calvin who, under God, established the Protestant and Reformed faith across the world. So, at the age of 17, having already mastered theology, he went off to the University of Orleans for the next five years to study Law. As with his previous studies in theology, Calvin gained a distinction in law – but this also, was a subject he did not love. But the atmosphere was stimulating. Intoxicating. University culture can be like this. The latest radical ideas are floated … recent trends in philosophy are shared on campus. So it’s not surprising that it was here that some of the radical reform ideas were floating around … translated tracts from a man called Luther. There was no significant yearning in his heart. Calvin wasn’t searching for God. It was the Renaissance scholars who caught his attention and especially Erasmus’ Greek NT he was reading. And certainly it was Luther’s writings. Melchoir Wolmar, an Arts graduate from Paris who’d moved to Orleans and grabbed Calvin’s attention particularly by his devotion to reading Greek. In fact it was Wolmar who inspired Calvin to study the Greek manuscripts of the university, including the now esteemed Erasmus documents of the New Testament. Calvin’s cousin, Pierre Robert a Waldensian reformer and the man called the ‘humble little translator’ for his landmark and radical French translation of the Bible. Never under-estimate the relational and life-changing influence of friendship at university, the value of serious–minded conversation and encouragement to read. Without singling out either of the above, this was where the seeds of conversion lay. Here was his mate Wolmar urging Calvin to learn the Greek of the New Testament, and Robert showing him fresh editions of his masterpiece French version of the Bible. Theirs was not the reputation for drinking and revelling. These guys studied hard and pushed the limits into the wee small hours to study and debate, to read and write. So much so that his cousin’s nickname stuck: Olivetan the man burning the midnight oil (it’s a play on words: i.e. reflecting the abundance of olive oil being consumed each night). So that in most of the histories, Pierre Robert is known as Olivetan, a Waldensian by faith (which was perilous) – the first to translate the Bible into French starting from the Hebrew and Greek texts. Can you sense the intellectual ferment? The year was 1529, this 20-year old French scholar, with an austere religious upbringing, now adorned with qualifications in arts, rhetoric and law … heard news of a breakthrough radical lectureship at the University of Bourges. So Calvin and his friends decided to leave Orleans to taste and see. This was new learning – critical investigation of sources replacing the intellectually deadening method of medieval learning – which was soporific – thoughts of every major scholar of the past parcelled out to students to learn, to play one opinion off against another – hoping that in the analysis of the whole, a better version of truth can be found. Can you see the fermenting process? Here’s the mix: serious-minded fellow students with renaissance spirit + radical, rather than medieval, lecturers to inspire them to think critically + exposure to original documents (such as the ‘dangerous’ source: the Greek NT). And so, without knowing the time of the place … was it 1531/32? at the age of 22/23?, enjoying this blessed company at Bourges University … Calvin scholars say he was born again – his spiritual conversion. Soon after graduating in law, Calvin had to return to Noyon … his father was ill, and subsequently died. Free of parental pressure, Calvin returned to Paris to continue his studies and became increasingly supportive of the reforming ideas that circulated the city. This was the early 1530s, Calvin associated with the Lutherans in Paris and his heart was moved by what he read and heard. Luther taught that peace of soul is found through faith in Jesus Christ alone and not in religious attachment to church or the sacraments. Further, Calvin enjoyed friendship with a distinguished physician and rector of the University of Paris, Nicolas Cop. In November, 1533, Cop was expected to deliver a public lecture to leading churchmen and the university professors. It was supposed to be as scintillating as a Vice-Chancellor’s graduation address – all about university enrolments and finances. But these two friends saw their opportunity to introduce reform ideas (in other words: he slipped in some Lutheran doctrines into a public address in Catholic Paris). Everyone recognised what he said as an evangelical sermon from Matthew 5 on the beatitudes. Cop’s bold talk created indignation and both civil and church authorities responded by calling for their arrest. Cop was declared as ‘that heretic’ and Calvin was implicated: guilt by association. Friends warned Calvin. Arrest and the gallows were imminent. Calvin slipped away ‘disappeared’ into the crowd. As he disappeared … there was no going back … he left the church and any chance of practicing law behind. Calvin secretly returned to Noyon to surrender all church office, but, as a fugitive, he did what Harrison Ford did and moved secretly from place to place in different towns of his beloved homeland. Though some influential friends looked out for him, by 1534 it was clearly intolerable to be anywhere in France, even in hiding, so he fled to the safe Swiss city of Basel … to find somewhere he could serve his Saviour without threat to his life. Basel was a free and friendly city and there Calvin and Cop met with fellow reformers such as cousin Robert (Olivetan), Farel and Bullinger. Basel was a German-speaking Swiss refuge for reformers that had been won over to the Reformation teaching by friends of Zwingli. Even the elderly Dutch theologian Erasmus lived there. In the safe haven of Basel … Calvin wrote his first books. You’d wonder what he’d start on? What would you start with? What would be most useful for the time? F By 1534 he had begun revising Olivetan’s French Bible, which was powerfully used to spread the gospel message, (we recall Tyndale for the English; Luther for the German speaking people). To Olivetan’s work Calvin added corrections and refinements. F And by March 1536 Calvin published his theological masterpiece: The Institutes of the Christian Religion – a cyclopaedia of Christian theology. A systematic and lucid explanation of all the main points of Christian faith. It’s no exaggeration to say that Calvin’s Institutes are the most influential systematic theology ever written, and it’s useful to pause here and reflect on it. To defend the evangelical Christian faith before the King of France so as to convince him that evangelicals are not heretical, but the true church. A MASSIVE claim. I hope we can appreciate Calvin’s thesis. This was the heart of Calvin’s claim: that it was the evangelicals that were the church. And this, despite appearances – because appearances would have it that the Pope and the Catholic Priesthood with its ritual and splendour is the church. I hope we can appreciate Calvin’s method: he didn’t ask for the reformers to be merely tolerated in Catholic France, or seen as a second church within the main church … he argued that the reformers (I think, rather, he called them ‘evangelicals’) are the right and proper and legitimate heirs of true Christian faith, as they and not Romanism, hold to the true gospel as found in the Bible and as held by the early Christian church and expressed in the Nicean Creed. It was breathtaking and audacious logic. The measure of the true church is its allegiance to the Gospel of Jesus Christ … and a few other things such as the proper administration of the sacraments of baptism and Lord’s Supper (that they do not deliver saving grace, and we’re not to pass them around to all and sundry). This was the breakthrough – there are better revisions of the book than his first edition, but this is a 25-year old genius on display. Six brilliant chapters, set out in a way that thinking Christians of the day could access, with very familiar pegs on which to hang thoughts. Qn. What did the average unschooled medieval worshipper know? Shortly after producing The Institutes, he left with his brother Antoine and their half-sister Marie (for their dad had married again after early widowhood) and headed for another safe-haven of Strasbourg. He saw this place as the place for reflection and study. But there was war in eastern France and, because of threatening troop movement, they detoured, entered Switzerland and stayed overnight in Geneva. 1530s Geneva was an island – between The Savoy and the Kingdom of France. Geneva was a walled fortress, a republic among Swiss provinces, a frontier city, headed by a Prince and ruled by an Assembly of Genevan citizens. And recently, this republic city had voted to ‘live by the gospel’ i.e. constitutionally it was an evangelical city. Into this fortress, the Calvin family booked in at the Inn. And … he was spotted. By the Genevan evangelist William Farel. Farel knew that the man sitting at the corner table of the tavern that night (head down in the books) was, in fact, the renowned author of The Institutes. Farel addressed Calvin and said that he must stay and help the church in Geneva. And that was it, or so Calvin thought. Calvin reluctantly agreed and stayed. At first he was a lecturer in theology, however by November of that year the city council appointed him as one of their city ministers. Very soon he was part of a Genevan delegation in a theological dispute in the city of Lausanne. It was a church debate over current trends, and, perhaps at the end of the pecking order, the ‘new boy’ Calvin was given a ticket. For three days Calvin sat in silence as leaders like Farel tried to convince the gathering of 170 Roman Catholic priests of reformed truths from the Scriptures. On the fourth day, as the Genevans were receiving a battering, and being accused of despising all the teachings of the early church fathers like Augustine, Calvin rose to his feet … and demolished the opposition. Calvin spoke from the Scriptures … and then entirely from memory quoted passage after passage from the church fathers in support of reform. When Calvin had finished, a Franciscan priest stood up … to confess his sin, ignorance and superstition and to announce his conversion to the evangelical cause. Day after day other priests followed and declared themselves for the reformation cause. Reform doctrines from the pulpit and public expositions of Scripture led to the application of doctrine in people’s lives and to reform of practices in public life. The city of Geneva was changing. Reputation grew. By the end of 1537, people came from far and wide to see the ‘Geneva experiment’. But, did the reformers press too hard? Too soon? Why did the bubble burst? Catholic Church officials were worried by the Genevan reputation. It was fast becoming a haven for Protestants. The program for reform and discipline met with intense resistance mounted by a well-organised opposition. Trouble was brewing and coming to a head on Easter Day 1538, not even 3 years since the invitation to come. This dynamic duo had plans for reform and presented this to the Council. All good reform ideas, but they were running ahead of the Council. And their reform was resented by many Catholics of the 200-member Council. Remember, in those days, the City Council ran the city and made ministry appointments to the church as well. The Geneva City Council, in a massive test of loyalty to the old ways, expelled Calvin and his three-year ministry closed. Calvin, Farel and another reformed minster – gone. Here John Calvin boarded with fellow reformer Martin Bucer and in this home he closely observed and enjoyed the company of the Bucers. Their marriage warmed Calvin’s heart to the idea. ‘I now want to marry, and I am open to any suggestions’. Now, there were a few false starts … but in the end E-Harmony delivers and John Calvin married Idelette de Bure. A sweet marriage. Idelette was a widow and brought two young children into the marriage. Then the Calvins had a boy of their own. Sweetness and sorrow. Calvin knew the joys of a sweet marriage … the comfort of a loving wife. He experienced the joys of young life in the home … and then the dreadful agony of the spectre of death. John and Idelette’s only child died in infancy. Then Idelette died of tuberculosis before ten years of marriage. So, with no surviving children of his own, Calvin was left to care for Idelette’s two. His brother’s family lived with Calvin and they had 8 children, so for much of Calvin’s life his home was full of little children. His Strasbourg interlude was also sweet because he was able to return to his studies: he rewrote The Institutes, published his first sermon series (Romans) and gave clear and convincing cases for the reformed faith in letters and tracts. He spent time with Martin Bucer refining theology together and working on the doctrines of the church, church order and Christian worship. He also spent his time as a pastor … ministering to the French refugees who he found in the city. There he was pastor to a church of nearly 400 French exiles. Meanwhile, Geneva was experiencing decline and disorder. Church attendance had dropped. Morals slipped. There was trouble in the city. By 1540, messengers from the City Council were sent to Strasbourg to retrieve their pastor. For a year Calvin agonised over this. When he did return to Geneva, September 1541, he returned to stay. And, on the day he returned he resumed preaching from the very text he had reached in his series when he had been banished three years previously. Geneva was his life-ministry. The Church of St Pierre was his pulpit. For this long 23-year Genevan pastorate Calvin preached and applied the Word of God continually and without compromise. He preached twice on Sundays and then on alternate weekdays as well. He preached directly from the Hebrew and Greek texts and without notes. On average, he preached about 260 sermons a year. His preaching reflects his commitment to the Word of God. Remember, the Reformation was based on a return to the supreme authority of Scripture, rather than the church and its tradition. It was a natural outcome, then, that the exposition of the books of the Bible would be the supreme commitment of Calvin. His mind was endowed with clear insight and sound judgment and he knew how to apply the Scripture to everyday life. John Calvin’s preaching was sequential in its pattern. For the duration of his ministry, Calvin’s approach was to preach systematically through entire books of the Bible. Typically, he preached from the New Testament on Sunday mornings, from the New Testament or the Psalms on Sunday afternoons, and from the Old Testament every other morning of the week. In this consecutive fashion, Calvin preached through most of the books of the Scriptures. It’s not possible to understand Calvin without understanding that he was pre-eminently a preacher. A large part of his time and energy was devoted to preaching. His sermons were understood by the average Genevan citizen – they were lively, illustrative, applicable and full of compassion. Above all, the theme of each sermon was faithful to the theme of the passage of Scripture before him. Having emphasised his preaching, yet he’s not only known as the preacher. He was involved regularly in weddings, baptisms and visitation of the sick. He visited prisoners on Saturday afternoons. Not only renowned and loved for his preaching, John Calvin also set about reforming the way the church organised itself. Early on in this his second Genevan stint, he passed through the Genevan Council his book on church polity: ‘Ecclesiastical Ordinances’. His overall concern was a church cannot hold together unless a settled government was agreed to – an order of government prescribed to us from the Word of God and in use in the early church. Though, of course, there was overlap. Eg pastors and elders joined together in church discipline. And the pastor may well be involved in all four. And, of course, he extended the role of the doctor in the church and centralised it more to the training college. From 1559, together with scholars such as Theodore Beza, Calvin established the Genevan Academy – a university with a specific focus on training pastors. Initially there were two professors: Calvin being one of them who lectured three times per week on the Old Testament. These are basically what we have today as the very extensive Old Testament commentaries of Calvin. Finally, on this subject, we mustn’t think that his vision was restricted to what was within the city walls. Calvin was not only concerned with building up the existing churches, he was deeply committed to establishing new ones. He sent pastors back to France to plant churches. Between 1555 and 1562 over a hundred men went out from Geneva to preach and pastor in other lands, mainly France. He trained and commissioned 14 missionaries to Brazil. His mind was genius. He gave priority in all his writings to the sovereignty of God. To Calvin, the thought of God’s sovereign mercy was so predominant it guided the whole of his doctrinal system. I think it’s fair to say that Calvin was consumed with the glory of God and the free offer of the gospel. Conscious of medieval Catholicism that held people in fear of hell, his pastoral desire was to comfort new believers. This is seen in that he beautifully explains and highlights the biblical doctrine of eternal election and irreversible grace. He reminded the church what the Bible taught: that a believer in Christ is chosen by Christ to eternal life and that he will never have to suffer doubt again about salvation. One who is truly saved by the work of Christ can never fall away. To believers who were anxious about their spiritual destiny and were told by their church to perform more good works to guarantee it – this was very good news indeed. Calvin teaches what Scripture teaches: that the heart of man is fallen, and dead, and incapable of acknowledging God … and needs the touch of God to awaken … which is predestined by God. Predestination gives the preacher of the Gospel great hope – that when he preaches the Gospel it is by God’s mercy, and not the preacher’s persuasion and power, that some will be saved. Predestination gives your Gospel church great courage to go out to your community and witness to the Gospel – assured that by God’s mercy, and not your persuasion and power, some will be saved. Predestination gives you great assurance – that by God’s mercy and not your power, you have been saved and that you will be kept secure until, the last day. Calvin’s teaching on predestination is anything but fatalism. Under God’s sovereignty he pleads, like any sound reformed preacher pleads, for the hearer to repent and turn from his sin and embrace the Saviour and believe. Calvin’s advice was regularly sought by many. He replied personally to all who requested advice. His letters amount to 11 volumes in his collected works. He wrote to people who asked: to friends, prisoners, pastors, politicians and monarchs. Even to Martin Luther, who never replied. He died in 1564, aged only 55 years. On his own instruction, he was buried in an unmarked grave and no one knows where it is. What we can learn from his life? The Genevan City council, through its Attorney-General, condemned Michael Servetus of heresy and condemned him to death. Many have falsely accused Calvin of being party to this. This is not right. Calvin had no power to condemn this man and no power to pardon him. Servetus was condemned by the civil council as heretic and sentenced to death. If there is fault in Calvin, it was that he did not speak out more strongly against the firmly-held practice of the day to allow and encourage civil authorities to try and execute heretics. Hersey, of course, should always and only be judged by the church. Heresy and blasphemy cannot be ever properly judged by the state. Not every Christian agrees with reformed theology. Calvin highlighted these distinctives (though in NO way invented them! One Genevan student (of Beza’s day, not Calvin’s) went away from the Genevan Academy disturbed. He was the Dutch theologian Arminius, and wrote some very clear tracts explaining anti-Calvinistic theology. One way to compare the two systems (Calvinistc and Arminian) is this (yes, over-simplified) schematic approach to the order of how things work in salvation. does it wait, and operate after a sinner has believed? This talk was delivered at Bundoora Presbyterian Church on 28th June 2017.